In my review of 2016’s Fantastic Beasts and Where to Find Them, I said that it was an enjoyable stand-alone adventure, but that its status as a franchise-launcher was in doubt. Unfortunately, Fantastic Beasts: The Crimes of Grindelwald has no allayed those concerns. An overstuffed mess as unwieldy as its title, this is as good an example of any as a “middle chapter” that suffers from obsessing over set-up and moving all the pieces into position on the chessboard to the detriment of actually telling much of a story. There’s also unfortunately a little of “George Lucas Star Wars Prequel Syndrome” creeping into J.K. Rowling’s screenwriting, as well as falling prey to the overindulgent excesses of when Peter Jackson returned to the Middle Earth trough with his laboriously expanded and drawn-out Hobbit “trilogy”. It’s possible that when all is said and done (there are supposedly still three more films to go in this Harry Potter spin-off series), The Crimes of Grindelwald may be perceived more favorably in hindsight, but as things stand now, the idea of three more movies of this feels more laborious than exciting. 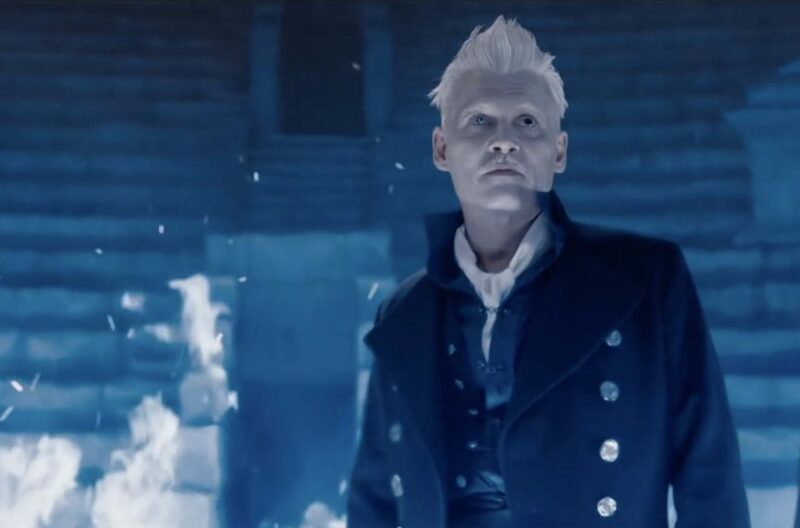 Dark wizard Gellert Grindelwald (Johnny Depp) was in custody at the end of Fantastic Beasts and Where to Find Them, but as comes as no surprise to anyone, he doesn’t stay there for long. After escaping, he sets out to rally his followers and to track down the tormented but potentially immensely powerful Credence (Ezra Miller), whose survival was implied at the end of the last movie and has now relocated to Paris seeking his birth family, where he’s fallen in with circus freaks including Nagini (Claudia Kim), who can transform into a snake (this character, like some others, feels more thrown in to give Potterfans a tingle than because of a real relevance to the goings-on). And Grindelwald isn’t the only one looking for Credence. 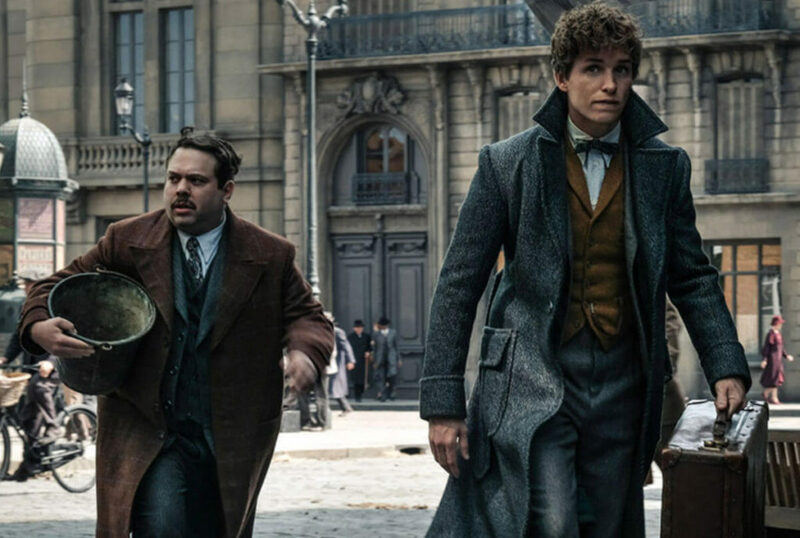 A whole ensemble of characters with their own agendas (some of which are clearer than others) are converging on Paris, including the ever-hapless Newt Scamander (Eddie Redmayne), who just wants to be left alone to play with the titular fantastic beasts (who’ve by now been officially been reduced to irrelevance in “their” own series) but is dispatched to Paris on a secret mission by Grindelwald’s old friend-turned-enemy, Hogwarts headmaster Albus Dumbledore (Jude Law). This propels Newt into awkward reunions with Queenie (Alison Sudol) and her No-Maj (aka Muggle) beau Jacob Kowalski (Dan Fogler), and eventually with Queenie’s sister and Newt’s would-be love interest Tina (Katherine Waterston), who’s on assignment from the American Ministry of Magic. There’s a whole menagerie of other randoms wandering in and out of the proceedings, including “the girl who got away” Leta Lestrange (Zoe Kravitz), who’s engaged to Newt’s Ministry official brother (Callum Turner), a mysterious stranger (William Nadylam) seeking Credence for his own murky purposes, among others, and unfortunately the movie has cooked up more characters and subplots than it knows what to do with. The biggest issue with The Crimes of Grindelwald is obvious. It’s overstuffed, unwieldy, and meandering, convoluted and way too busy with too many characters and subplots, especially when half of them feel pointless. What’s really the point, for example, of Leta Lestrange, or Newt’s brother, or the crooked Auror, or Yusuf? Credence, who is stuck in a tiresomely one-note mode of perpetual angstfest (Ezra Miller’s emo band-esque performance doesn’t help), was probably the least interesting part of the first movie, so him being made into a walking MacGuffin here doesn’t help invigorate matters, and the “surprise reveal” about his character not only is ho-hum after being built up to the entire runtime, but also seems to contradict previously established Potterverse canon. There’s not much action, and what little there is—primarily Grindelwald’s opening escape from an airborne prison-carriage, and the climactic fracas at his unsubtly Hitler-esque rally—is flat and unexciting. The moments inside Newt’s briefcase with his menagerie of fantastic beasts provide a lighthearted and whimsical respite from all the convoluted machinations going on, but despite providing the series title, the fantastic beasts have been reduced to cameos, with the slight exception of Niffler, who’s trotted out a couple times as a plot device. Ironically, the only moments that stand out are a few small, low-key character-oriented ones. Despite Leta’s overall superfluity, the childhood flashbacks of she and Newt have a sense of poignancy. So too does a moment where Jude Law’s Dumbledore gazes into the Mirror of Erisid (what he sees may be more revealing to Potterfans than casual viewers). Young Newt is played by Joshua Shea, who is both physically well-cast and uncannily nails both Eddie Redmayne’s mannerisms and speaking style as the older version of the character. Another nice bit of physical casting is Callum Turner, who is easy to buy as Redmayne’s brother. Jamie Campbell Bower, who made a fleeting appearance in a flashback as a young Grindelwald in the Harry Potter series, serves the same purpose again here. The possibly more-than-platonic undertones in Dumbledore’s youthful relationship with Grindelwald (“we were closer than brothers”) are hinted at in low key, thinly-veiled fashion that may pass over casual viewers’ heads but will be clear for those who’ve kept up with J.K. Rowling’s own public comments on the characters. After the last movie stayed in the United States, it’s nice to get to see Hogwarts again, including the Mirror of Erisid and the Great Hall filled with floating candles, and a Defense Against the Dark Arts lesson involving a Boggart. Alas, while a little fanservice and Easter Eggs are welcome, the movie goes overboard, shoehorning in various elements, including the Lestrange family, Nagini, and Nicholas Flamel (Brontis Jodorowsky), that feel more thrown-in to excite Potterfans than because they really needed to be there. After two movies of J.K. Rowling cutting out the middle man and directly penning the screenplay herself, it’s time to suggest someone (perhaps Steve Kloves, who scripted most of the Harry Potter movies and is still onhand as a producer?) step in to polish and fine-tune things a little. All the meandering running around doesn’t give the actors much time to do a lot of acting. Eddie Redmayne, Katherine Waterston, Alison Sudol, and Dan Fogler, who formed an unlikely but likable fledgling team in the first movie, are reduced here, partly by virtue of not having much screentime all together. Redmayne and Waterston don’t get much screentime together, meaning the budding romantic undertones present where we left off last time are still left spinning their wheels. Meanwhile, Sudol and Fogler, who managed to stay on the right side of the fine line between comic relief and annoyances last time, have slipped over into being annoying, and the direction Queenie is taken in here won’t sit well with everyone. 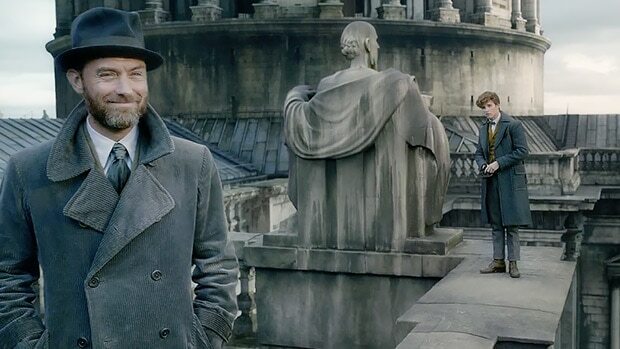 I have mixed feelings about Jude Law as Dumbledore. The “Muggle”-esque wardrobe of suits and trenchcoats seems an odd contrast with the stereotypical wizard wardrobe Dumbledore sported in the Harry Potter series, and I’m not sure how much his performance says “Dumbledore”, but he imbues his interpretation with touches of warmth, subterfuge, and regret, which are three qualities lining up with what we know of the headmaster. It’s easier to come to a concrete opinion of Johnny Depp, who’s phoning it in and picking up a paycheck. In my review of the first film (in which Depp made only a last-minute cameo), I expressed hope that he would set aside his usual campy shtick in favor of something darker and more sinister more in line with his chilling performance in Black Mass. As it turns out, Depp has gone neither route, instead content to sleepwalk through on autopilot. Depp’s lazy and uninspired portrayal of the series’ big bad only reaffirms the opinions of those who felt the filmmakers should have cast a more committed character actor at the expense of whatever waning “star power” Depp still possesses. When all is said and done, The Crimes of Grindelwald feels disappointingly superfluous. Over two hours of overstuffed running around, and we’re left with a plot that feels like it’s barely advanced an inch. It remains to be seen what Rowling and filmmakers have in store for future installments, but if it continues in this laboriously protracted vein, one wonders how many will be left caring by the time we get to the real meat.